The International Federation of Journalists has recorded 29 deaths of media workers in the region in 2018, all in countries which boast democracy, or a version of it. In early June, a group of journalists, activists and union leaders stood together in a dark huddle – lit only by the dim glow of candlelight – outside a hotel in Kathmandu in Nepal. Silently, we paid our respects and gave quiet tribute to one of our colleagues, Kashmiri journalist Shujaat Bukhari. The 50-year-old editor of the feisty and seminal Rising Kashmir had been gunned down only days before outside his office in Srinagar. Bukhari did not stand a chance. Shot multiple times in the abdomen and head by unidentified assailants on a motorcycle, the bullets killed him instantly. Even a bodyguard couldn’t shield him. He also died. And so we mourned. We mourned the loss of a comrade and colleague. But we also mourned the loss for the people of Kashmir. Who would tell the stories that needed so desperately to be told? Bukhari was a great fighter for truth, an incredible voice and an amazing mentor to many in Kashmir and beyond. It is not just a hole he has left, it is a gaping chasm. His is just one of 32 stories of loss we have in the Asia-Pacific in 2018, the highest number of deaths recorded by the International Federation of Journalists (IFJ) since 2014. They were journalists, editors, drivers, camera operators, television reporters and broadcasters. 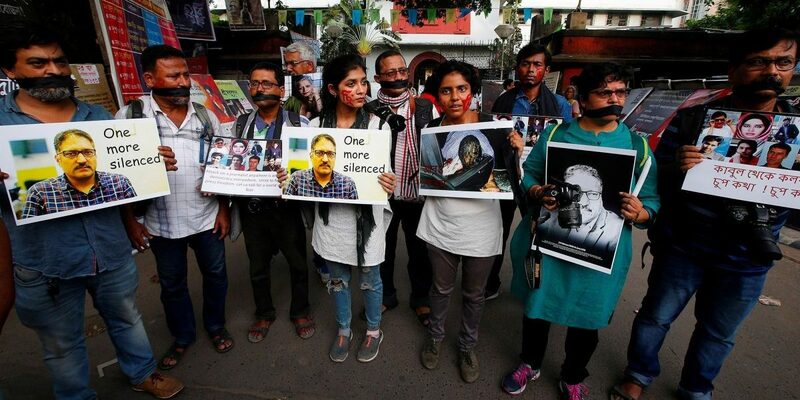 South Asia is the world’s deadliest region with 29 media workers killed. But the numbers only tell a part of the story. All of them died in countries which boast democracy, or some version of it. In India, there has been a disturbing trend of targeted attacks by vehicles, with four media workers killed in that way. News World TV correspondent Sandeep Sharma was riding his motorbike when he was hit and killed by a truck in Madhya Pradesh. Sharma, who had previously reported on police involvement in illegal sand mining activities, received death threats. His case, however, was filed by police as an “accident”. CCTV footage of the horrific incident tells it differently. Including Bukhari, 15 journalists lost their lives in targeted shootings or were lethally caught in the crossfire. Another 12 died as a result of being in the wrong place when car bombs detonated or suicide bombers unleashed. Afghanistan is by far the region’s blackest hole. On one single horrific day in April, nine journalists died in the capital city of Kabul in suicide attacks. The killer, disguised as a journalist, detonated himself in the middle of the gathered media scrum. The same day in Eastern Khost province, 29-year-old BBC reporter Ahmad Shah was on his way home when armed men on a motorbike opened fire and shot him dead. In all, 15 journalists died this year doing their job in Afghanistan. Deathly explosions were more often than not the weapon of choice by those seeking to unseat stability and order in the troubled nation. In Pakistan and the Philippines, there were more shootings. Five journalists were directly targeted and shot in Pakistan. And despite the ongoing criticisms of the Philippine government’s efforts to stem the tide of journalist killings, there has been no letup. Another three broadcasters were shot dead. The influence of politicians in the bloodbath has to be told, he says. But that’s another story. Jane Worthington is acting director, International Federation of Journalists (Asia-Pacific).